How can we as teachers engage kids in content and improve learning? a deeply-rooted means of arousing intense interest. In Part I, we looked at Lust, Mystique and Alarm. Today . 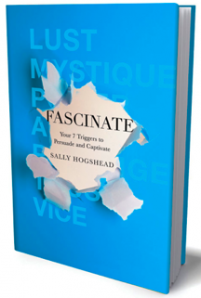 . . the last four triggers you can use to fascinate your students. Live where the kids live – if you don’t already have an academic online presence, you need one. Create a Facebook page for your classes, publish a blog, use tools like TxtBlaster to communicate with your kids concerning academic issues. Thanks for the very interesting Part II. Your translation of Hogshead triggers to the realm of education is helpful and relevant. The prestige factor is very interesting: It’s essential to find and engage students where they are — online, on their phones, etc. The challenge is to do so in a credible way that motivates students while maintaining educational fidelity. Thanks for the comment! Like I said, I’m still struggling a bit on the best way to incorporate all of the triggers into teaching. But am convinced that teachers need to think more intentionally about how the brain works when planning instruction. Hogshead’s triggers provide at least some structure I can use to help me plan.